The pathologist who conducted the first post-mortem tests on a man who died in 2009's G20 protests in London has been struck off the medical register. Dr Freddy Patel wrongly said Ian Tomlinson died from heart problems. A medical tribunal earlier concluded he acted with "deficient professional performance" over his examination. PC Simon Harwood, who had pushed Mr Tomlinson to the ground but was cleared of manslaughter, is facing Met Police disciplinary proceedings in September. 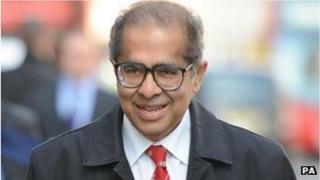 Mr Tomlinson's widow, Julia, said she was "pleased" Dr Patel had been struck off and would not be able to put other families through their ordeal. Dr Patel's conclusion that the newspaper seller died of a cardiac arrest was questioned when a video emerged showing him being pushed and struck with a baton by PC Harwood. Further medical reports suggested he had actually died from an injury to his liver that caused internal bleeding and then cardiac arrest. Earlier this week, the Medical Practitioners Tribunal Service said Dr Patel's work was "deficient" and ruled that he is not fit to practise. In total, 68 failings were identified by the service in Dr Patel's work on the case of Mr Tomlinson. Reacting to the ruling earlier in the week, Julia, said Dr Patel's "incompetence" had given the family "an uphill battle for justice from the start". An inquest jury found that Mr Tomlinson had been unlawfully killed but PC Harwood was cleared of killing him at a subsequent crown court trial. Dr Patel, who qualified at the University of Zambia in 1974 and has practised as a pathologist for 35 years, did not attend the Medical Practitioners Tribunal Service (MPTS), sitting in Manchester on Thursday. He was excused attendance to look after his sick wife but listened in on the hearing by conference call from London. The Rev Robert Lloyd-Richards, who chairs the MPTS fitness to practise panel, said Dr Patel had an "unwarranted confidence" in his ability, "a deep-seated attitudinal problem" and also "lacked insight". The General Medical Council said it welcomed the decision. Niall Dickson, its chief executive, said: "This means he is no longer able to practise as a doctor in the UK. "We asked for him to be removed from the register as the best way of protecting the public because his conduct fell far below the standards we expect of a doctor." Last year, Dr Patel was given a four-month ban for dishonesty and omitting key findings after examining the body of a murder victim who he said had died from natural causes. Sally White, who was murdered by Anthony Hardy in north London in 2002, had injuries which included a bite mark and a head wound. Hardy went on to murder two more women later that year. Dr Patel also served a three-month suspension for failings in other cases and had been removed from the official register of approved forensic pathologists. Meanwhile, Scotland Yard has said that PC Harwood's gross misconduct hearing - which is expected to last up to four weeks - will be held in front of a panel of three people, including a senior officer and a lay person. It comes after the Independent Police Complaints Commission ordered that PC Harwood should face the internal hearing in public.